How Does Kitty Litter Work? Over the past 75 years, kitty litter has come a long way. Once upon a time cats made do with boxes of sand and ashes; today the litter options fill long aisles in retail stores. Litter materials include clay, bentonite, silica pearls and some alternatives made of newspaper, pine or other biodegradable materials. Absorbent clay was a step up from sand and ashes because it offered better odor control. Over time, clay litter improved, adding ingredients such as baking soda or charcoal to help absorb odor from urine and feces. When a cat urinates in clay litter, the urine runs through the clay to the bottom of the pan, which helps control the ammonia scent until the clay becomes too saturated with urine. Daily scooping of feces minimizes odor. When the pan is saturated, which usually takes about a week for one cat, the old litter should be dumped, the pan cleaned and filled with fresh litter. The magic ingredient in clumping litter is sodium bentonite, a type of clay. The sodium bentonite reacts by swelling and binding the urine-soaked litter together into a mass when it becomes wet. Clumping litter is available in a variety of formats, including scented, unscented, multi-cat and low-tracking formulas. 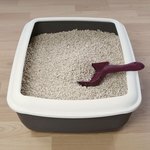 The ability to scoop out urine and feces daily means the litter box odor is kept to a minimum, however the box still needs to be thoroughly cleaned and the litter replaced at least once a month, depending on how many cats use the box. The majority of clumping litters aren't safe for flushing down the toilet because of their expansive quality. As the name implies, silica gel pearls are made of silica. Despite their solid appearance, they're actually filled with a matrix of hollow tunnels. When the cat urinates in the pearl-filled box, the pearls act as a sponge to absorb the moisture and odors from the urine, which is trapped inside the pearl to keep the outside surface dry to the touch. Eventually the moisture evaporates from the pearls, leaving the odor inside, allowing the pearls to remain absorbent for up to a month for one cat. Silica pearls aren't flushable and the litter needs to be deep enough to catch the urine before it reaches the bottom of the litter box. The litter should be raked daily so the moisture has an opportunity to evaporate from the pearls at the bottom of the pan. Corn, wheat, pine, newspaper and other biodegradable litters are also available for filling your cat's litter box. Some clump, thanks to natural binders such as starch, while others work like clay or silica pearls, acting as sponges to absorb urine, leaving sawdust behind. Tip: Cats can be choosy about the type of litter they prefer. Litter size, texture and scent preference can vary from cat to cat. The "best" cat litter is the one your cat will use reliably.